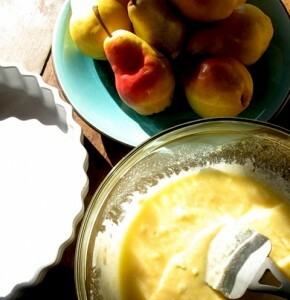 I love getting up early on a winter morning and baking in a sunlit kitchen. To me, the scent of fresh baked goods, coffee and fragrant, warm spices makes a house feel comforting and homey. So this morning, when my cat nudged me awake before the sunrise, I started a fire in the wood stove and began throwing open the cupboards and canisters. Fruit from the fall harvest is still plentiful at my local orchards and markets, and as you may have noticed, I have been enjoying it ! Although I have been writing a great deal about heirloom apples lately, in truth I have a great weakness for all fall fruit – and I am particularly fond of pears. Simply gazing upon their blushing, golden beauty as they bask in the early morning light on my table, I find them absolutely irresistible. 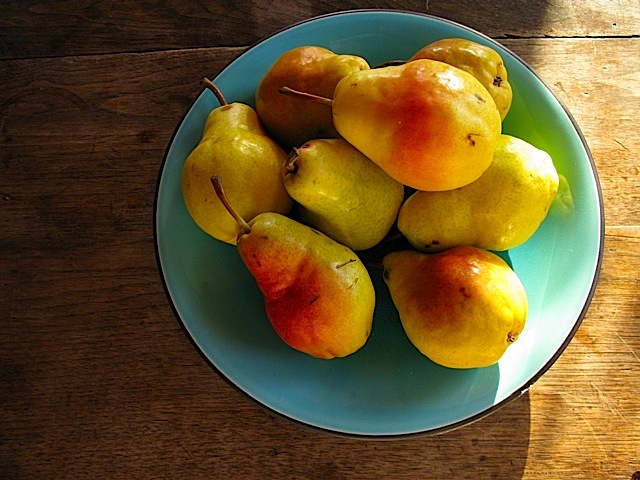 Sometimes I will buy a few pears, intending to poach or bake with them, and then I will eat them all before the weekend. The flesh of this sweetly perfumed fruit has such a beautiful, delicate texture, usually I can not control myself. 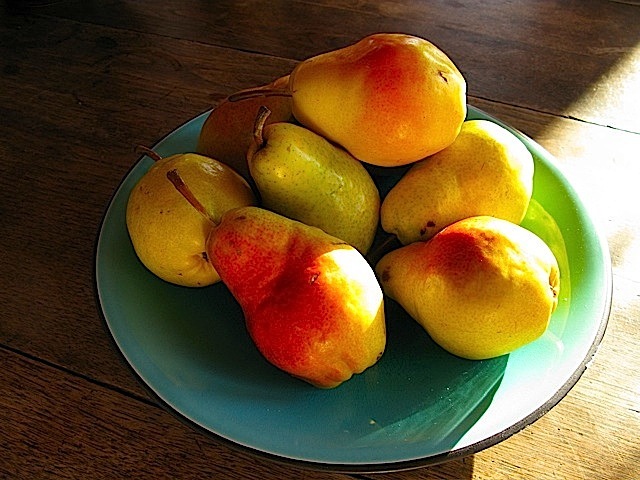 But this time I bought a dozen Bartlett pears at the market, enough for baking as well as for impulse-pleasure. Last week I mentioned my fondness for Marion Cunningham’s delightful Breakfast Book. Marion’s collection of recipes includes many delicious coffee and breakfast cakes. Also last week, while visiting one of my favorite cooking blogs, Clotilde Dusoulier’s Chocolate and Zucchini, I found a slightly different twist on a much loved, basic coffee cake from Marion’s book. Gateau au Yaourt is a simple and easily modified French cake recipe. Clotilde posted a variation on this yogurt cake with apples and maple sugar, (in honor of her nephew’s first birthday – we are both new aunts, and I was excited to read that she takes this as seriously as I do!). I tried this cake and I absolutely loved it. 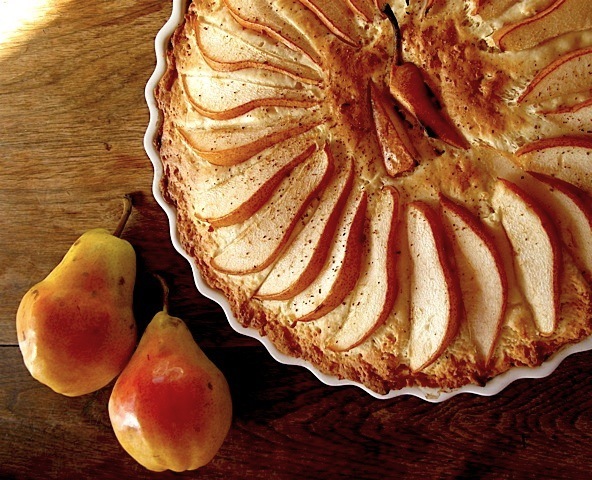 So, this morning I decided to combine Clotilde and Marion’s recipes together, adding fresh Bartlett pears atop the cake, and the result is quite delightful, (I am enjoying a slice with coffee as I write to share this with you). I think the subtle, exquisite flavor of Bartlett pears works perfectly with this recipe – it’s a simple, easy-to-make treat for this wintery, holiday season. 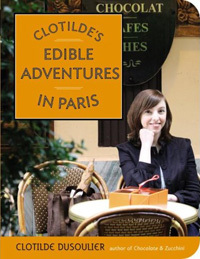 I am so enamored of Clotilde’s cookbooks that I have ordered several copies to give as holiday gifts this year. Her blog is fantastic, and I was hoping to attend her book signing in New York in order to meet her, but we were hit with a severe snow storm and I was unable to drive to the city. Sigh. Next time! 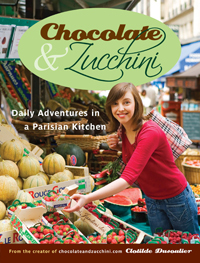 Clotilde’s Edible Adventures in Paris is her latest collection of wonderful recipes. Her instructions are always easy to follow and her style of writing is both clear and entertaining. I could go on and on, but I am sorry, I need to finish eating my slice of cake ! Warm oven to 350 degrees. Melt butter and set aside. Core and thinly slice three ripe Bartlett pears to wedges. Set aside. Grease a 10″ round, ceramic pan or cake dish with butter. Mix yogurt, eggs, vanilla, rum, sugar and melted butter in a large bowl. In a smaller bowl, sift together the flour, baking powder and baking soda. Combine the dry ingredients with the wet and blend until just mixed. Pour mix into the greased pan. 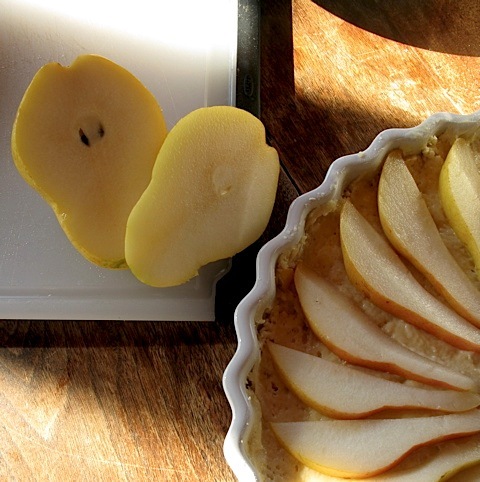 Arrange sliced pears in a circle atop the cake and sprinkle with fresh ground nutmeg and cinnamon. Bake for 40 minutes. Remove from oven and test with a stick for doneness. Let the cake sit for 15 minutes before removing from the pan or serving. Bartlett pears look so beautiful on my table, it is almost like having Cezanne to breakfast. As a matter of personal integrity, all product and book reviews on this site are purely editorial. No payment of any kind is received for mention here. However, The Gardener’s Eden is an Amazon.com affiliate, and any purchases you make at Amazon by accessing the store through links on this site will help support The Gardener’s Eden by netting this site a small percentage of the sale. Thank you ! You are currently viewing the archives for Sunday, December 13th, 2009 at The Gardener's Eden.